I absolutely love hearing about how God has used and is using the Five Minute Friday community to impact individuals as they progress in the writing life. This story from Lesley, a long-time FMF community member, is a wonderful testimony of the Lord’s gentle and consistent prompting and guidance. As I took a deep breath and pressed “publish” for the first time, releasing my words into the world, I had no idea what to expect. I had been writing for years, but only in journals. I had never shared my writing with anyone else, but there had been a growing sense that it was what God was calling me to do. I can’t remember how I found out about Five Minute Friday, but somehow I discovered it, and when I saw that Kate was also hosting a study of the book, On Being A Writer, by Ann Kroeker and Charity Singleton Craig, it seemed like a good place to start, so I signed up. As we worked our way through the book, I learned so much about writing — from the content of the book, but also from the practice of writing a blog post reflecting on each chapter, and from reading the reflections of others who were taking part. I was amazed by the sense of community and, despite my inexperience, the other participants welcomed me with open arms and encouraged me with their comments. By the end of the study, I knew that writing was something I loved and wanted to do more. Since the study finished in September 2015, writing has become an important part of my life. I have taken part in FMF almost every week, written another blog post most weeks, completed Write 31 Days and contributed to the FMF book. Recently I have begun submitting some work to other places and have had pieces accepted by two online magazines! I have also had some rejected (let’s keep it real!) but I would never have had the confidence to submit them in the first place without the support and encouragement of my blogging friends, including many I first connected with through FMF. The biggest surprise to me throughout this journey has been the strength of the blogging community. I never thought it would be possible to have friendships with people I have never met in person, but I’m so grateful for the love and encouragement that has been shared here and it has definitely inspired me to keep going. It was also the main factor behind the biggest decision of my blogging career so far – giving up the pseudonym I wrote under for my first year of blogging to begin writing under my real name. This was a scary step to take, but an important one in finding my voice and the confidence to own my words, and I was overwhelmed by people’s grace and understanding. It has also played a significant part in helping me enjoy greater freedom in other areas of life. I look back with gratitude that God has led me on this journey and that he has connected me with FMF. I appreciate each one of you and all that you do to make it such a loving and welcoming community. As I look to the future, I still have no idea what to expect, but I’m sure that God has further plans for my writing and I’m looking forward to seeing what He has in store! Lesley lives in Scotland and works doing youth work with a Christian charity. She is also involved in a church plant which is just about to celebrate its first birthday! In her spare time she enjoys music, theatre, reading, writing, and walking in beautiful places, enjoying God’s creation. She blogs at Life in the Spacious Place and writes to encourage people that, whatever their circumstances, there is always hope to be found in God. You can also connect with her here on Facebook and on Twitter. I am so thankful to have found you through the FMF Community. Hopefully life will calm down for me soon so that I can return. Blessings! Thanks, Barbie. I’m grateful to have connected with you too! So good to see you with the fist post on this new site, Lesley! And to know a little more about you. We must have been in that group (On Being a Writer) together and I didn’t even realize it. Looking forward to this new venture for Five Minute Friday. Thanks for visiting me here, Debby! Yes, we commented on each others’ posts in that group but it’s probably the fact that I was using a different name then that confused things! I was just reflecting on the fact that two years ago we did the writing class in August. Well, almost two years. Our writing has evolved and am so grateful to know you along this journey. I know, it’s hard to believe it has been almost two years! I’m glad to be on this journey with you, Gabriele! Thanks for your encouragement, Carolina! Good community is definitely important in helping us grow. Love to you too! Leslie, getting to know you through the FMF study of the book On Being A Writer has been one of the biggest blessings in my writing life. Even though I don’t regularly post on FMF, especially since the focus of my blog has changed to helping other ladies with chronic illness, I try to never miss one of your posts. Thank you for your lovely comment, Barbara! I’m so glad we connected and I love reading your posts too! And I had no clue you are from Scotland! It was a big step of faith but I’m glad I did. Thanks for coming and visiting me here! I loved hearing your story. It has given me the confidence or boost to continue writing. 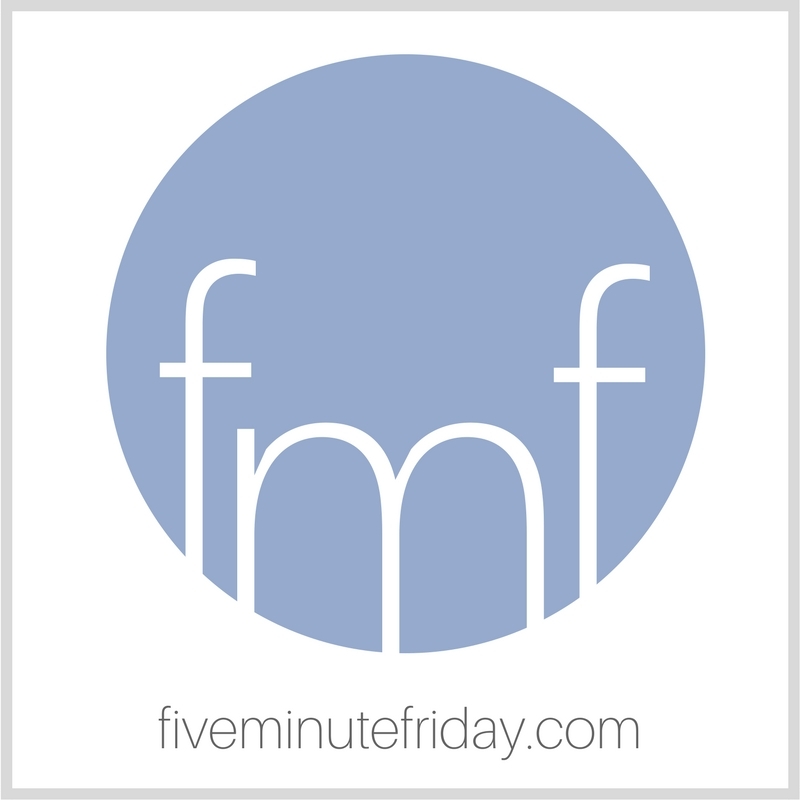 I am always intrigued by the Five Minute Friday posts that I read. Thanks, Maree. I’m so glad it encouraged you. FMF is a wonderful community and it’s amazing to see the variety of posts that can be sparked by a single word. You’d be very welcome to come and join us! I couldn’t agree more, Lesley. The fmf community is amazing! I’m so glad you stuck with it and continued to write. You were one of the first friends I made here. Thank you for being so encouraging. Thanks, Mandy! I’m glad we connected and I’m grateful for your encouragement too! Hi Lesley! How lovely to see you here at five minute Friday.com. What a joy to read about your journey from journal writer to blogger, and to finally use your own name too. Writing really is a process, and you have moved so well and so strongly to where you are now. God bless your journey, and bring you even closer to him and to the blog world too. Thanks for visiting me here, Ceil, and for your encouragement. I’m glad we’ve connected on this journey! So thankful for you and your friendship Lesley, I’m excited to continue witnessing the Lord’s work in and through you and your writing! Thanks, Bethany! I’m thankful for you too! I love seeing you here Lesley. FMF is an amazing community because of the vulnerability and open hearts of people like you. So blessed to know you and your heart for writing. Thanks, Mary. I’m glad you came and visited me here. I am so glad I’ve got to know you too!